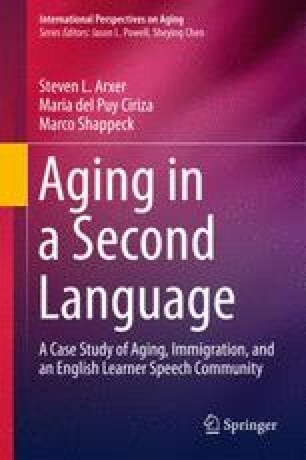 This chapter focuses on placing elder minority language acquisition in the context of immigration. Acknowledging demographic changes in the United States, we focus on the risk factors associated with immigration and acculturation. Specific attention is given to the economic, social, and cultural effects of immigration on Hispanic immigrants. Exposure to a new country can negatively affect older adults in particular, as poor and economically disadvantaged populations are disproportionally excluded from key institutions and resources. Sociocultural factors profoundly impact minority aging, since acculturation and assimilation are linked with socioeconomic status. We, thus examine the cultural and structural factors that uniquely impact Hispanic elders in an immigrant context. The unique barriers for older immigrants are well documented. Institutional disadvantages exclude immigrants from the type of resources and social networks important for language acquisition and, in turn, impact larger indicators of well-being and language performance.